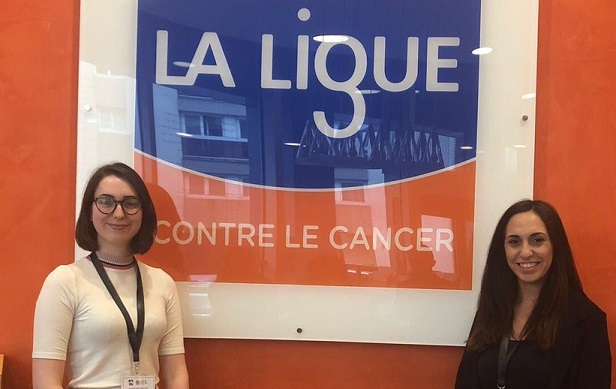 Cancer Leagues Youth Ambassadors (YA) summer school which took place at the French Cancer League in Paris along with 30 other young people from across 27 EU countries, from different backgrounds but one common goal: to prevent cancer. Most YA were medical students however, more interestingly, some had a background in a nonmedical field e.g. economics, and international relations, many of whom had a personal/family experience of cancer. The aim of the summer school was to equip us to be able to make changes to reduce cancer risk in the countries we were representing. Talks included the principles of persuasion, how to address vaccine hesitancy, as well as the use of IT for patient empowerment. Some YA presented the actions they had taken in their countries, such as organising fayres against cancer prevention or talking on popular TV shows. Learning about their struggles and persistence was truly inspiring, showing their dedication. I am honoured to represent both Cyprus, my home country, and Scotland, where I have lived for the past 4 years. The dual ambassadorship leaves me with mixed feelings however. Cyprus lacks action on cancer prevention (e.g. fully implementing the no-smoking law passed many years ago). Also I am very proud to be part of the Scottish Cancer Prevention Network, which was referred to on many occasions as a good example of positive change. We also prepared for the joint action across all countries, in collaboration with the UICC, for the 2019-2021 World Cancer Day campaign (I am and I will).